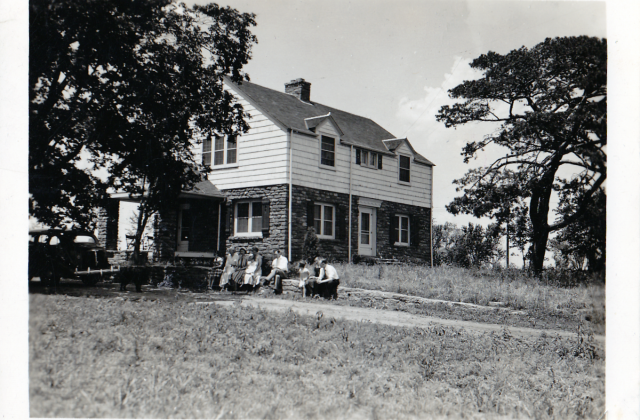 The farmhouse of Robert Carhart Mitchell and Katherine in the 1930s. Robert was a son of Robert Gwyn Mitchell and Lena Bell Carhart. He was born 1895 March 9th in Macon, Missouri. The farmhouse was located in Kansas somewhere around Lawrence, Baldwin being the nearest town. Though they lived on a farm, they didn’t farm so much as they leased out land, Katherine keeping a vegetable garden. 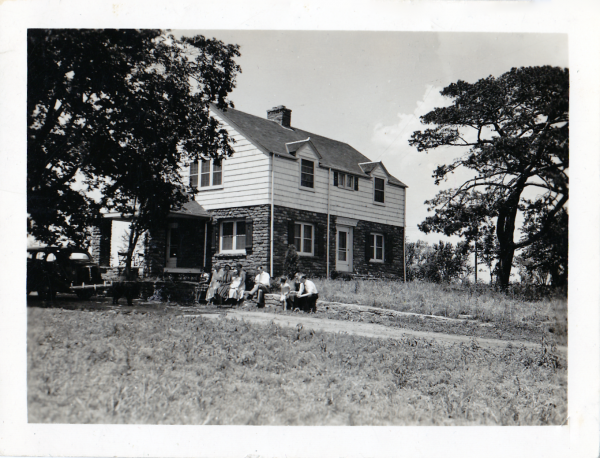 Again, the 1930s, at the farmhouse. 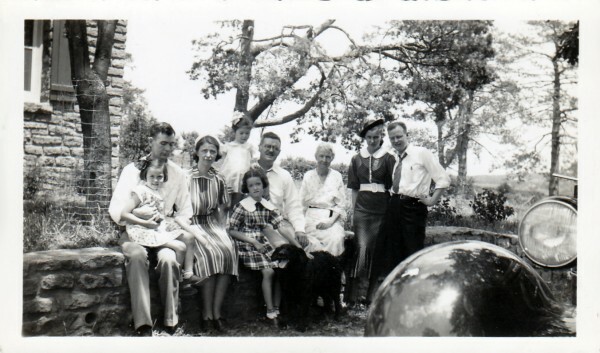 The adults to the left are Albert McClure and Dorothy Mitchell McClure, then Robert Mitchell (with the mustache) and his wife Katherine. Standing are Benjamin Dysart Mitchell and his wife Helen Ojala. Ben, Robert, and Dorothy Mitchell McClure were siblings. Ben was born 1908 July 29 in Macon, Macon county, Missouri and died 1991 Aug 26 in Duluth, St. Louis, Missouri. He was married to Helen Ojala 1937 Nov 25. Robert Carhart Mitchell married Katherine Stuart Holloway on 1925 June 15. Katherine was born 1896 May 7 and had previously been married to Harry Charles Ziesenis who was born Sept 1896 in Kansas. Harry died in WWI, Jan 12 1919 in France and was buried at the Oak Hill Cemetery in Lawrence, Kansas. The 1920 census for Lawrence, Kansas shows Katherine as a 23 year old widowed daughter-in-law living in the household of Charles Ziesenis at 700 Mississippi Street. Charles was 50 years of age, who was born in Kansas, his parents born in Germany. His wife was 50 year old Emma who was born in Illinois, her parents from France. They had a son named Ray who was 21 and born in Kansas. Katherine was born in Illinois, her father born in Indiana and her mother in Kansas. Robert was a geologist and worked for an oil company, traveling around the world and at one point living in Sumatra. In 1936, his “Methods of Studying Physical Characteristics of Crude Oil Within the Reservoir” was published by the University of Kansas. 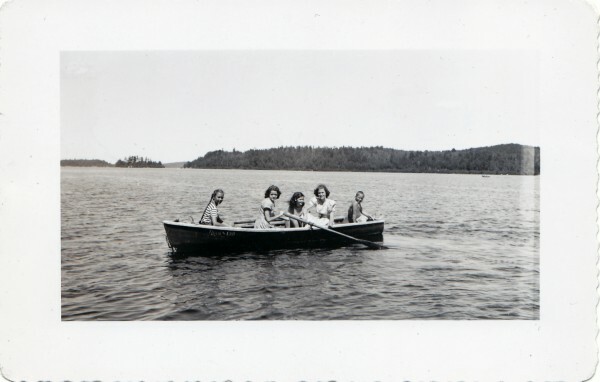 McClures and Mitchells boating at Kenora, Canada below Winnepeg. Robert Carhart Mitchell died May 28 1966. Katherine died 1980 Feb 2 in Sarasota, Florida.